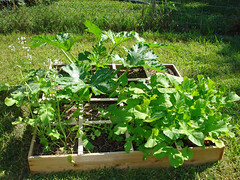 The bed with yellow squash in the back, two kids of radishes on the right, and on the left are some radish greens that i grew from seeds meant for sprouting, so they don't have a radish bulb but the greens are enjoyed by the iguana. 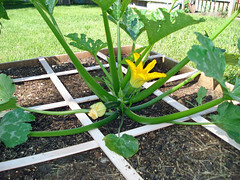 Closeup of the zucchini plant. Looks lush and green, congratulations on your new gardening efforts this year. 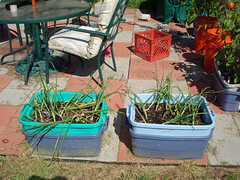 Next year I'll do better beds that are actually dug into the ground and leveled (these are just sitting on the grass), probably two 4'x8' beds. 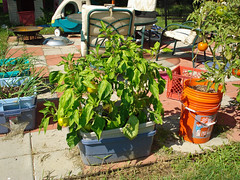 I have three wonderful basil plants that smell wonderful but I have yet to use them in any cooking. 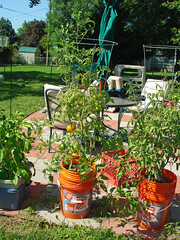 If anyone told me last year that I was going to be doing 64 square feet of garden, I'd have laughed at them. I've had great luck with the beefsteak tomatoes, but the heirloom tomatoes (purple Russian, I think) crack so much that most of the tomatoes just aren't that good. In about a week I suspect that I'm going to have more zucchini and yellow squash than any family could ever eat, and I only did one of each plant. basil pesto, yum. Or saute some garlic, toss in a chopped tomato, and cook for a few minutes until it starts to break down, then add a handful of chopped basil. Just let the basil wilt a bit and serve it over pasta-- yum! 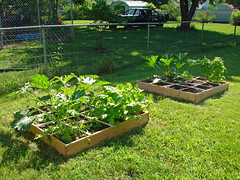 The garden looks great and makes me hungry!